Visit the holy mountain of Montserrat and Gaudi's Crypt on a one day trip! Take a trip to the highest point of Montserrat by taking the railway to the top of the mountain. Here, you can take in the beautiful views and visit the Monastery. You might even be able to hear the famous Basilica choir boys perform Gregorian chants and other religious choral music. You can also explore the Gaudi Crypt (declared a World Heritage Site by UNESCO). The Gaudi Crypt is located inside the Colonia Güell, a textile village packed with surprises. •A tour from Barcelona which includes nature, spirituality and architecture. •The first stop is the Colònia Güell, where you’ll be able to visit the Crypt, the building that Gaudí used as a test bed for many of his architectural solutions before he built the Sagrada Família. 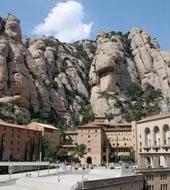 •The second stop is the mountain and Benedictine monastery of Montserrat, which was founded in the 11th century, located in a natural park 60 kilometres outside Barcelona. •Fully equipped coaches, from Barcelona. •A courier travels on board throughout the trip. •Complete informative guide with detailed information about Montserrat and the places to visit. •Itinerary: Barcelona - Cripta Gaudí and Colònia Güell - Montserrat - Barcelona. •Guided tour in Gaudí Crypt - Colonia Güell and glass of cava. •Ride on the rack railway to Montserrat. •Discounts at museums, places of interest, shops and restaurants. •Audioguide system in 10 languages for sale on board: Catalan, Spanish, English, French, German, Italian, Japanese, Chinese, Portuguese and Russian. The same audioguide system is valid for all three routes and has an extra charge of 5€. 8.30am on Tuesday and Friday. from Plaça Catalunya (in front of El Corte Inglés). Passengers should arrive 20 minutes before the bus departs. Arrival back in Barcelona at 4 p.m. at Plaça Catalunya.